Invisiblemadevisible : UK Street Art & Culture: Anthony Burrill I Like It. What Is It? An exhibition at KK Outlet celebrating the launch of Anthony Burrill’s new book of the same name. Sometimes the world of graphic art can start to look like the background in Scooby Doo – the same thing on repeat which after a while starts to blend into one. Then there’s the instantly recognizable and iconic work of Anthony Burrill. His use of classic letterpress typefaces and devastatingly simple slogans creates work that is exquisitely crafted, profound and playful at the same time. The title of his 2012 project with Mesa & Cadeira “How to say the most with the least.” beautifully sums up his approach to work. For the first time a selection of his best-known works have been repurposed exclusively for a new book of posters I Like It. What Is It? on heavyweight art paper and a sticker sheet in special inks. On the back of each poster is a description of the project and comments on Burrill’s work from key collaborators. 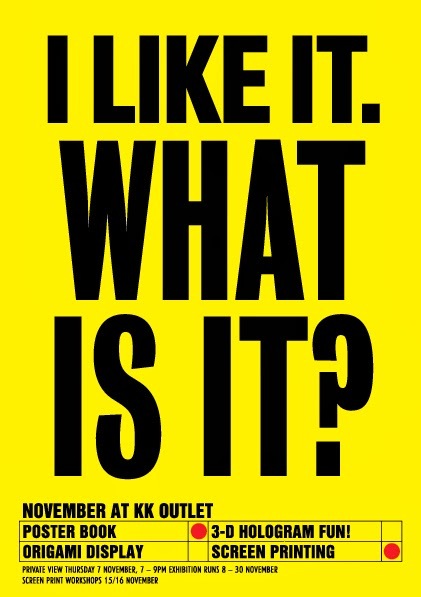 An exhibition showcasing work from the book will run throughout November at KK Outlet. In this film shot by Andrew Telling, Anthony Burrill talks about the new book .